An herb garden is easy to grow, use, store and share. An herb is any plant used for cooking, fragrance, or to make drinks or medicine. The term herb is also used to mean herbaceous, which is a botanical term for a leafy plant that doesn't get a woody stem. Most plants we call herbs are indeed herbaceous. Ethnobotanist, scientists who study the relationship between people and plants make a differentiation between herbs and spices: Herbs are plants we use the leafs, stems and flowers of, whereas spices come from other parts of the plant such as roots, bark or seeds. Some examples are cinnamon, from bark, turmeric, from a root, and pepper, a seed. 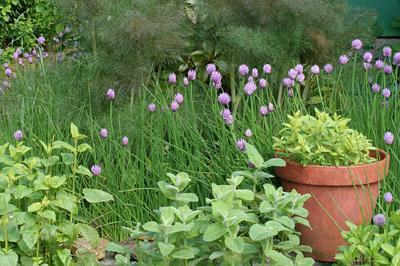 Common varieties include basil, chives, thyme and mint. An herb garden is of course a garden containing herbs, but that can mean a few terracotta pots on the back steps or an acre of carefully designed beds with hundreds of types of plants. Either way, an herb garden can be a lovely and useful thing. Humans have used herbs for food and medicine for all of recorded history. Gardeners in ancient Egypt, Greece and Rome all included them in their courtyard plots or in containers to have them close at hand. In Europe during the Renaissance, knowledge of early civilizations came to light through texts and manuscripts. There was a great interest in useful plants, and herbs began to be collected, classified and studied as never before. Physic Garden, places to grow plants for apothecaries, or drug stores, were created by some of the most wealthy and influential families of Europe. The first physic garden was built in 1543 at the University in Pisa. Later gardens were created in Padua, Florence and in England. The Chelsea Physic garden, near the banks of the Thames in London, was built by the Royal Society of Apothecaries in 1673. Most of these gardens still exist today and are open to the public. Traditional herb gardens were laid out in geometric patterns. Plants could be organized according to use, botanical relationships, country of origin or appearance. Formal versions in the Elizabethan period in England had neatly clipped herbs in elaborate knot or maze configurations. Later gardeners took a looser, more organic approach, arranging plants in pleasing masses that accentuated color, form and texture. Most have structural elements that contrast with the plantings. These can be brick paths, stone containers, walls, metal gates or statuary. Contemporary versions show a wide variety of influences and range from formal to casual. Most herbs like full sun, well drained soil and even moisture. Those native to the Mediterranean region, such as rosemary, lavender, and sage, are tolerant of drier conditions and thrive in warm weather. Amending the soil with organic matter is advisable. It promotes both good drainage and moisture retention, adds nutrients and encourages beneficial microbes. Plant transplants in the spring after all danger of frost is past. To get an early start on the season, plant seeds indoors 8 to 12 weeks before the last frost date for your region. See individual herb articles for information on pruning, pests and diseases, and harvesting. Many types are beautiful in the landscape and garden. Look for varieties with variegated foliage, showy flowers or interesting growth habits, such as trailing or compact. Herbs work well when planted together, or in association with vegetables to attract beneficial insects. They make a handsome addition to a cutting garden, border or container plantings. Try growing an herb garden in pots on a sunny windowsill for fresh flavorings year round. Fresh or dried, herbs planted in decorative pots or dried arrangements and crafts make great gifts for gardeners, cooks or decorators.